The American south is known for its meat-rich diets and plethora of bar-b-que joints. 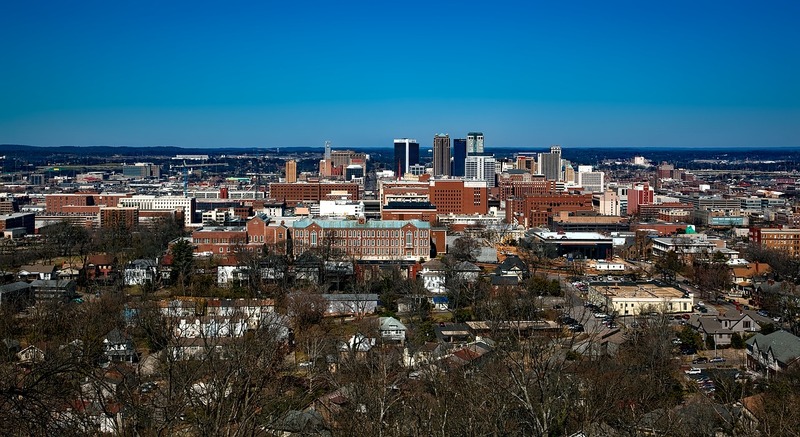 However, even among the smokey grills, Birmingham, Alabama is home to a meat-free and plant-based retreat called Golden Temple. Golden Temple is a natural grocery health food store and plant-based cafe. The cafe is open for breakfast and lunch Monday through Saturday and they have been operating in the Southside neighbourhood since 1973. For over 45 years, this neighbourhood staple has served residents of Birmingham (and more recently they have opened up a second location in Trussville, AL) offering vegetarian, vegan and gluten-free options. On one side of their building, you can shop for fresh produce, frozen foods and a large selection of grains and legumes. On the other side sports a quaint cafe, featuring a vegetarian daily special along with a rather large menu of vegetarian and vegan choices. Throughout both sides of the establishment, they showcase a boutique with beautifully stained glass ornaments you can purchase for gifts. These stained glass decorations add a real sparkle to admire while you are having a healthy meal as well. Additional ambience comes from the many plants and greenery growing in pots around the parameter of the cafe. I unknowingly arrived on one of their most popular days for the daily special – Wednesday’s Mac and Cheese day! Prices seemed particularly affordable for a vegetarian meal in this very popular neighbourhood. My plate was less than $9.00 dollars and once I saw the portion size I was even more impressed with the value. You order at the counter under a whiteboard that lists the specials. 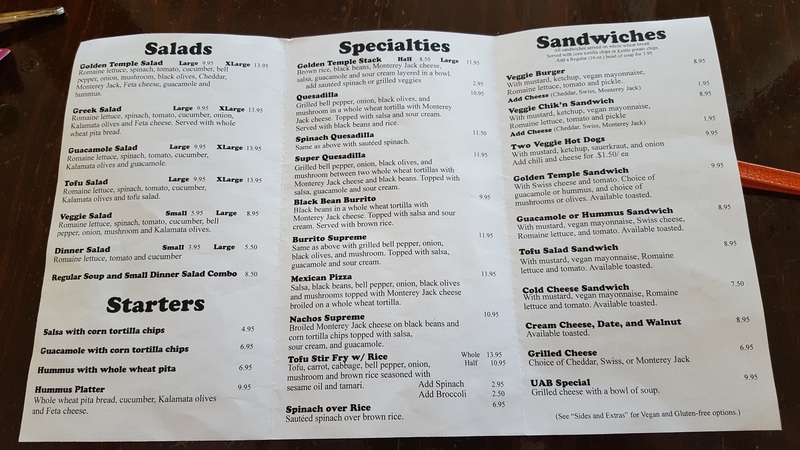 They also have a printed menu with many vegetarian and vegan options. It was nice to see so many items to choose from beyond just a salad (and the salads were still really appealing as well). 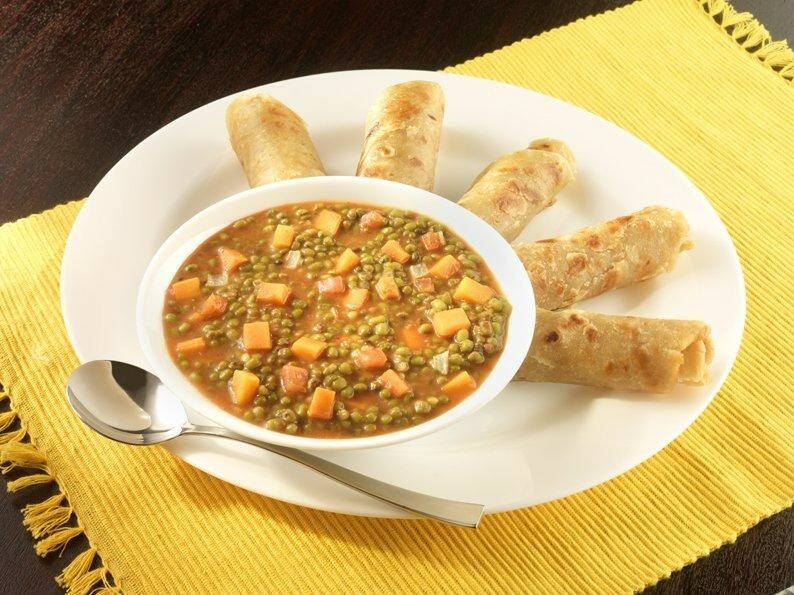 Some of their specialities include a bend toward Mexican flavours with vegetarian quesadillas, burritos and nachos. They also offer a vegan stir-fry bowl and what they call the “Golden Temple Stack” which is layers of brown rice, black beans, guacamole and veggies. There is a long list of various sandwiches to choose from too – some as simple as a hummus sandwich to veggie hot dogs and veggie burgers to a vegan “chicken” sandwich and vegan tofu salad sandwich, prepared with Vegan mayonnaise. I especially thought it was smart to include a menu item called the “UAB Special”. This is a nod to the University of Alabama Birmingham (UAB) campus which is just a few blocks away. And once sitting down for my meal, I noticed many college patrons. Based on their menu selection and prices, it’s the perfect spot for a health-conscious student to grab a quick bite between classes. Additionally, the cafe is open on Saturday, also making it special since some downtown food establishments aren’t open on the weekend, preferring to cater to business people working in nearby offices only. The UAB Special includes a grilled cheese sandwich with a bowl of soup. Soup options change daily. While I was there they were featuring an Indian Dal soup. My Mac and Cheese Special included two sides of freshly prepared veggies of my choosing. They had a few different options for the sides, including some beans as well as steamed broccoli and spinach with feta. I opted for the two latter selections. I also asked if they carried vegan mac and cheese and while the clerk told me they discontinued the vegan mac and cheese daily special option, she stated that almost everything on their menu could be made vegan. The vegetable sides that come with the daily special also would make a very hearty vegan plate if you wanted to go that route. The sauteed spinach can be ordered without the feta and would be extremely flavorful even without the cheese. It had a tamari type of seasoning that I really enjoyed and I could see pairing well with many other menu options. 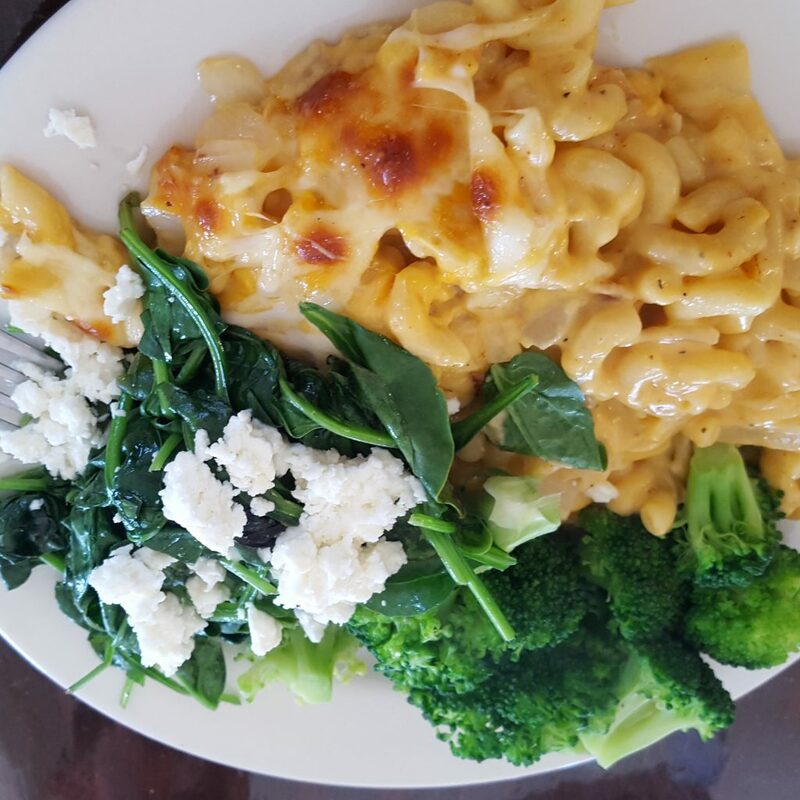 The mac and cheese was very filling – in fact, I wasn’t able to finish my portion and I was rather hungry at the time. The cheese sauce includes some sweet onions which I enjoyed but they were large enough to eat around if that’s not your favourite thing. 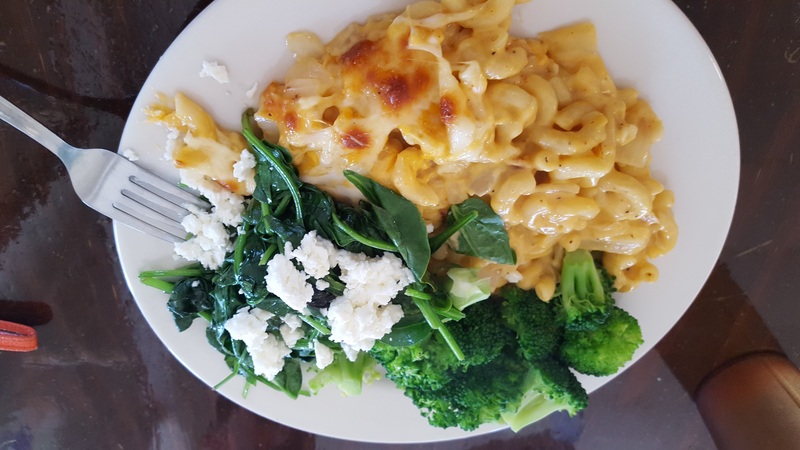 I was really pleased with the steamed broccoli too – it still had a bite without the usual soft texture you sometimes find with over-cooking. There are many selections for drinks, including fresh juices. Their espresso machine seemed to be getting a lot of use while I was visiting (another nod to helping the college students out!). I think another unique selection of the menu is the “Build Your Own Smoothie”. You can pick as many fruits as you want from the list, choice of liquid (it included almond and soy milk as options) and a protein of your choice (such as peanut butter or yoghurt). I opted for a blueberry/banana/almond milk smoothie and enjoyed it. Lauren has a passion to write and travel! She has a Master's Degree in Business and is a native English speaker from the US. Lauren's favourite destination is Paris.